Valentine sweet heart bracelet with tiny handmade heart charms and pink beads on silver chain. This romantic swirling hearts charm bracelet is a perfect gift for your Valentine! 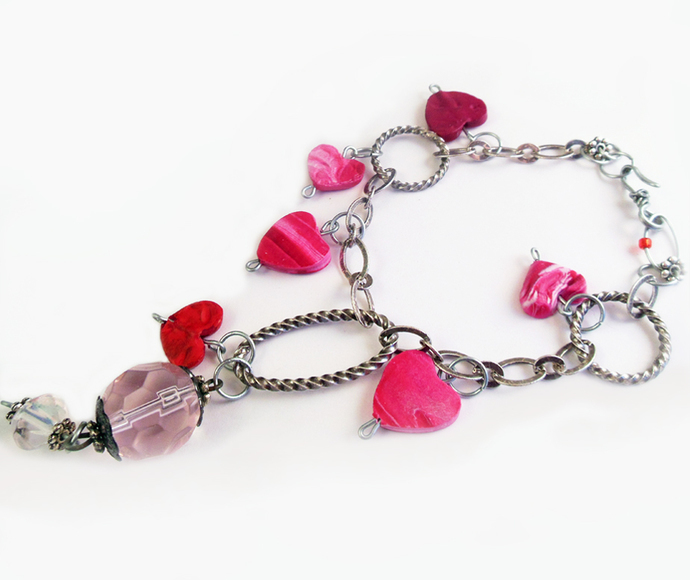 This bracelet features tiny handmade heart beads, swirling with pinks, reds, and whites. They make a dainty and sweet statement hung alongside the pink faceted glass focal beads! The beads and charms dangle from a twisted silver-tone chain with the links welded shut. A handmade hook clasp holds the whole look together! The links allow for more charms to be added, if you wish, giving this bracelet your own personal touch!